As the Second World War was nearing its end, the Nazi order was falling apart, and the Allied powers raced to carve up Europe and establish the conditions of the peace. At war’s end, Germany was divided into four military jurisdictions. The Russians controlled the east, while the US, Britain, and France controlled the west. The German capital of Berlin was divided the same way, despite the fact that it lay deep within the Soviet jurisdiction of East Germany. As you can imagine, tensions were running high from the beginning. Having a western military enclave in the midst of Soviet East Germany was deeply frustrating for the Russians, and the Soviet leaders did everything they could to push the western Allies out. Probably the high water mark of these tensions came in 1947 and 1948, when the Soviets closed off the roads to the city, hoping to starve the western powers out. In what became known as the Berlin Airlift, the US and its allies succeeded in holding out for almost a year, supplying the city with around-the-clock air deliveries of food and other vital supplies. By the summer of 1948, it was clear that West Berlin would remain under Allied control. Still, West Berlin represented an ongoing problem for the Soviet-aligned authorities in East Germany. The western powers worked hard to make West Berlin a showcase of democratic governance and capitalist economics. With its shining buildings, modern jobs, and free markets flourished, many East Germans weren’t satisfied to watch from across the line. By 1961, about 20% of East Germany’s population had defected to the West – most of them passing through West Berlin. That year, the East German government finally had enough. They decided to close the “West Berlin loophole” and end the massive brain drain out of East Germany. It started as check points and barbed wire around the whole of West Berlin – 91 miles. Soon, they erected concrete barriers, walling West Berlin off like a city under siege. Over time, the East German government kept developing taller walls. They installed a broad “death strip” in the middle, where those trying to flee across the barrier could be shot on sight. By the time the wall was fully developed, it was massive – with concrete sections twelve feet high and four feet thick. Barbed wire, observation towers, and regular canine patrols sought to ward off any who would dare attempt entry into the forbidden city. It wasn’t until 1989 that the standoff began to fall apart. In the face of widespread protests and a weakening Soviet grip, the repressive East German government was teetering on the edge of collapse. 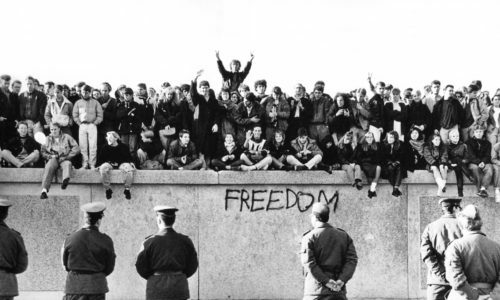 Even in this environment, it was a huge surprise for ordinary Germans and people around the world when the East German government announced that the wall would be opened for free movement of people, effective immediately! In response to this dramatic news, the people of both East and West Berlin were out in the streets that very night, celebrating. That weekend, more than 2 million East Berliners crossed over to the west, holding one of the greatest street parties in human history. Ordinary people began to physically dismantle the wall with hammers and chisels. Berlin was free, and very soon all the rest of Germany would be, too. And the whole world was left wondering – how did this happen? How do you go from shoot-on-sight, concrete barriers, and razor-wire bunkers to free movement, literally overnight? How could the Soviet-backed regime in East Germany that seemed so powerful, collapse under its own weight in a matter of months? In January of 1989, the long-time leader of East Germany, Erich Honecker had predicted that the Berlin wall would easily stand for another 50 to 100 years. How could he have been so wrong? It makes you wonder what kinds of nonsense we’re taking for granted today. Think of some of the institutions, authorities, and economic forces that seem so invincible right now. Will they last another 50 to 100 years? Could it be that they’ll collapse in the next few months? One of the things that made Jesus so special to his first disciples was the way that he could see beyond appearances. Jesus saw through the veneer of holiness and authority of the priests and religious leaders in his society. He saw beyond the bristling power and raw brutality of the Roman occupiers and their puppet dictator. While most everyone around him imagined the future as an extension of the past, Jesus saw that the past, present, and future have one sovereign author. When the priests insisted that their systems of power and social control would last forever, Jesus predicted a day not too far off when the Temple would be laid waste. And when the Roman rulers threatened him with terrible torture and death, Jesus could see to the end of them, too. He saw past the pomp, grandeur, and violence of human ambition. He bore witness to the truth – to a kingdom that has overcome the power of death. Jesus said to his disciples, “Take courage. I have conquered the world!” Crucified by the powers and raised from the dead, Jesus Christ has unmasked the rulers and authorities of this world who claim their own self-sovereignty and deny the power of love. Jesus has revealed the bankruptcy of the powers, the emptiness of their threats in the face of the all-powerful, never-ending, fearsome love of his Father. Our Father. The Berlin Wall fell in 1989, but the spirit of this wall is alive and at work in the world today. There are millions of us in our country right now whose primary solution for the very real fear and grief we feel is to “build the wall!” How much we’ve forgotten. It wasn’t so long ago that building walls was recognized as a signature mark of authoritarian regimes and oppressive dictatorships. And yet, this idea of building walls is nothing new. How many of you have actually seen the wall that divides the United States from Mexico? You wouldn’t forget it. It’s taller than the Berlin wall, for one thing – 21 feet tall, and six feet deep. On the US/Mexico border – today, before we “build the wall” – right now there are 580 miles of border fence. That’s six times longer than the Berlin wall. There are many other walls throughout the world – walls dividing Gaza and the West Bank from the rest of Israel/Palestine. Barriers separating eastern parts of Ukraine from the rest of the country. Border fences holding back a tidal wave of desperate refugees who are seeking refuge in Europe. We live in the age of the high wall and guard tower. In preparing to speak to y’all tonight, I have felt very clear that the heart of the message is this: We don’t need to be afraid. We live in an age of fear. Have you noticed? All the television channels are dialed up for maximum terror. Every news item, every advertisement, every weather alert, practically every piece of media that we commonly encounter is designed to tap right into our most base instincts – our lizard brains that know very little beyond fight, flight, and… another f-word. We need to be real about this. I know that we know this. Intellectually, I think that every one of us in this room realizes that we live in a culture of fear and manipulation. But do you enter your day prepared? We are in a spiritual warfare here. The powers of evil – Wall Street, the Pentagon, cable news, Facebook ads – this whole culture is busy seeking to pull their false world over our eyes. Don’t be afraid. Have courage. Jesus has conquered the world. But stay awake. Stay awake with Jesus, and don’t be fooled by the siren-song lullaby of marketers and politicians. Stay awake and keep watch, because the Holy Spirit is on the move. The Holy Spirit is here tonight. The same power that overcame the Berlin Wall is right here with us, ready to break down the walls that separate us from one another. From love. From the truth. We can’t do this on our own. We can’t stay awake without help. We can’t see like Jesus sees unless he guides us. But the good news for those of us gathered here tonight is that Jesus can. He will guide us. “Take courage! He has overcome the world.” And we can, too. “Not by might, nor by power, but by my Spirit, says the Lord of Hosts” – those are Zechariah’s words to us. The Lord of Hosts – that means, the “Lord of Armies” – he’s a conquering God. In Jesus we worship a conquering God. Not a conquerer like the world understands it – not a bloody tyrant of guns, germs, and steel – but a loving God who overcomes the darkness with light, hatred with love. Still, I have to ask myself: Why did the Berlin wall fall when it did? How could it be that the rulers and authorities of East Germany were so confident in the oppressive order they had established? How could the leader of East Germany, the very year that his government would collapse, how could he predict that the wall would stand for another 50 or 100 years? And why did most of the world believe him? We live in an age of wall and guard tower. We live in a time when there are so many Berlin walls that remain standing, seem invincible. Here in this city where we meet. Our nation. Our world stands divided on so many levels. Our friends and family – we ourselves – have been deceived. We have traded the truth for a lie. We’ve chosen to live in darkness and despair, rather than dwelling in the victory and power that Jesus promises. In this age of walls, barbed wire, vampire capitalism, and ecological catastrophe, it feels like the powers of death and oppression are eternal. We are here tonight to declare that these powers have already been defeated. Jesus has conquered them. They stand naked and empty. Their authority has been stripped away by the blood of Jesus. Think of the Berlin wall the day before its gates were opened. Judging by outward appearances, it was as solid and fearsome as ever. But the Spirit of Jesus could see deeper. He saw to the heart of the matter. He knew with infallible, loving justice that that wall would fall tomorrow. The injustice we see in the world today has already been conquered by the sacrifice and Spirit of Jesus. As his friends and disciples, it is our great privilege to walk with him in revealing the spiritual nakedness of Empire, and the spiritual emptiness of its walls. Each one of us is invited to take up a hammer and begin chipping away at the dead edifice that stands so fearsomely before us. Take courage. Jesus has conquered the world!